What does this part of France have to offer? Big open countryside, clean fresh air, forests, woods and a big big sky. Climate tends to be like southern England only a bit more extreme - hotter and sunnier in summer and colder in winter. The population density is very low and the roads are empty. There is no crime to speak of, no vandalism and no graffiti. The people are polite and friendly. Young men in their cars pull up to let old ladies cross the road and the nearest thing to a "rave" is the many family-oriented summer and autumn events in the villages and towns, where all are welcome. Two hours is the norm for lunch, which costs about 11€ in one of the many restaurants. You might as well have lunch because most of the shops close between 12 and 2 anyway! Unspoilt is probably the best description, maybe like England was a few decades ago but with better food. 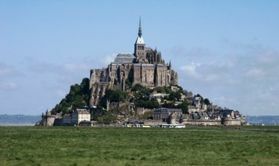 It's an easy and pleasant journey from the channel ports and once here it is equally easy and unstressful to get to some of the most famous and desirable places in northwest and western France. Environs - what's to do? In the immediate vicinity there are plenty of ancient public chemins (footpaths) to explore. 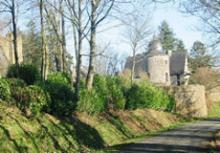 Right on your doorstep we have a large field in a valley, reached by a private chemin where you can picnic or walk. The country roads are quiet and traffic free and ideal for walking or cycling. Mont Rochard (7 km), our local "mountain" is heavily wooded, offering beautiful walks and Le Bois du Tay (10 km) is another forested area not far away. The nearest bar/restaurant, general store and boulangerie are in Izé, 3 km away with more bars, restaurants, boulangeries and local supermarkets in Bais, 7 km. Most are open on Sundays but please check times locally. Courcite, 8km in the other direction, has a bar/restaurant and an excellent boulangierie. Villaines-la-Juhel, 13 km, is the nearest town of any size and has a wide variety of shops, bars and restaurants (including a pizzeria) and a large supermarket which sells practically everything. Petrol and diesel here are the cheapest around and the pumps are available 24/7 (but you'll need a French bank card for out-of-hours service). There's a weekly market in Villaines every Monday morning and there's nothing more pleasant than sitting in the sunshine outside La Gouline and watching the world go by (with an aperitif of course!) Evron (16 km ) has a large market every Thursday morning and has even more bars, restaurants, shops and supermarkets. If you fancy a change from French food there is an excellent Cambodian/Chinese restaurant (usually open Sundays and holidays!) and there's a cinema. 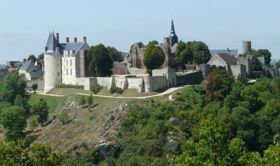 The town of Mayenne is well worth a visit and the newly restored château an absolute must... maybe lunch on a boat on the river? If you like old French towns you will love Sainte-Suzanne, Fresnay-sur-Sarthe, Saint-Léonard-des-Bois, Saint-Céneri-le-Gérei and many more. 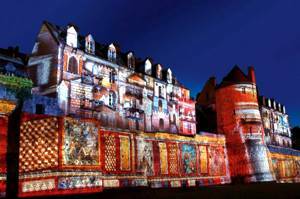 The one place not to miss is the fortified old Plantagenet cité of Le Mans. 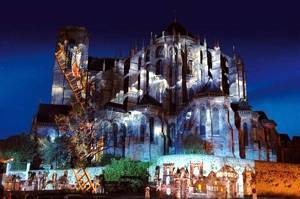 The beautiful flying-buttress cathedral and medieval houses in their cobbled streets are impressive at any time but especially so in the evenings of July & August when they are illuminated in the most magical display of light, colour and sound. 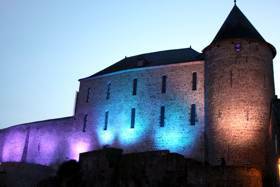 The fortification wall is Roman and is the one of the best preserved examples in Europe. So see 1600 years of architecture come alive! The spectacle is free but if you want to dine in the old town you are advised to book. For a real "day out" try Bagnoles-de-l'Orne (43 km), an elegant old spa town with its sophisticaion, casino, superb restaurants and wonderful scenery and walks. There's so much more - this is just a flavour of what's within very easy reach of La Goupillère. But you shouldn't ignore what's on your doorstep.... explore it! 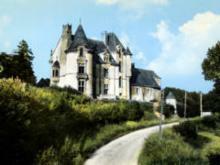 La Goupillère is in the commune of Saint-Thomas-de-Courceriers. The village itself has a lot of interest. 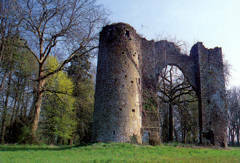 Apart from being quintessentially stuck in time, there's the remains of a château, sadly mostly demolished in the 60's, but you can still find the ancient fortress and battlements. The old tower of the château is now a very well appointed and unusual gîte (called Courceriers) for up to 3 people (so not competition!) so if our house is too big for you, try here. 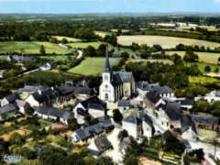 The commune has a website which contains a wealth if information about the village, its history and its environs. If you are planning a visit to the area you should take some time to go through the website and in particular the pages that have information about and direct links to most of the interesting places and sights in the surrounding area. The website is in English and French.